Four years ago we published a concept article on catamaran-style trawlers (PMM, Fall &apos;97). Author Graham Pfister explored the possibilities and advantages of a cruising power cat, even though, at that time, the only power cats were dedicated speed machines, fast craft designed for fishing or as motor yachts. None was particularly suited to our trawler lifestyle: gunkholing, anchoring in quiet harbors and cruising self-sufficiently for extended periods. Pfister made a convincing argument for the displacement cruising catamaran, one designed from the keel up to go long distance in comfort, stability and safety. Efficient diesel power and fabulous maneuverability were added to the list of benefits. Excellent fair weather cruising, economical higher speeds, shallow draft, expanded accommodations, built-in stability and improved tracking were all arguments well made. In the last few years we&apos;ve seen a lot of progress, and PMM has already brought you several articles from happy owners who chose a cat as the vessel of choice. We see new cruising cats introduced on a regular basis, and even the most ardent traditionalist will someday have to concede some of the benefits of this modern boat. To get perspective on where cats are going, I spoke to the folks who stand at the head of the line. Fountaine Pajot is the world&apos;s largest builder of catamarans, having launched 1,000 catamarans (power and sail) during their 25- year history. Fountaine Pajot produces 120 boats per year, an impressive number when compared to other catamaran and trawler companies. It is a large enterprise. Situated in La Rochelle, France, the company is at the forefront of catamaran design and development, although this cutting edge expertise is in stark contrast with local surroundings. La Rochelle is one of those delightfully picturesque towns that optimizes the French joie de vivre. A three-hour high-speed train ride from Paris, La Rochelle is picturepostcard pretty, with a rich history dating back to the tenth century. The sea has always played a major role in the story of La Rochelle, from its position as a bustling port and fishing center in the twelfth century, through a French monarch&apos;s siege in the early 1600s, to the indestructible World War II Uboat pens from which wolf packs hunted Allied shipping. Das Boot operated out of La Rochelle. As much as people love the romance and architecture of the City of Lights, I fell in love with La Rochelle. It has the romance of Paris, perhaps on a more intimate scale...and it&apos;s on the water. Old buildings make up much of the well-maintained town center, including the twin towers of St. Nicholas and La Chaine, standing guard over the inner harbor. Today La Rochelle is much more than some quaint tourist attraction. It has a population of more than 100,000 people and is home to several large technology industries. One of these is Fountaine Pajot, the third largest boat builder in France, employing 500 men and women. After the 1976 Olympics in Montreal, competitive sailors Jean Francois and Pierre Fountaine joined forces with champion racer Yves Pajot to build racing dinghies. They began with classic 505 racing sailboats and dinghies but got addicted to offshore racing through single-handed transatlantic races on sailing multihulls. Eric Bruneel, Fountaine Pajot&apos;s general manager in charge of export sales, was also an avid dinghy racer, joining the company in 1983. He explained that they soon discovered the higher comfort levels on the multihulls, a feature especially appreciated after several days of nonstop racing. Crews returned much less tired than those competing on monohulls. An idea was born from this early racing program. In 1984/85, Fountaine Pajot came out with their first cruising catamaran: a 37-foot sailboat that joined the increasing number of French designs introduced during the period. The French passion for multihulls is well documented, and literally hundreds of these boats have launched from French yards. Fountaine Pajot introduced their first trawler catamaran in 1998, a lightweight cruising boat that proved a catamaran&apos;s advantages were not simply theoretical. A smaller boat, the Greenland 34, soon followed the Maryland 37, and both highlight the company&apos;s interpretation of the market-as well as the design vision of noted French yacht design firm Joubert-Nivelt. I spoke with Eric Bruneel about the tenacity required to bring new ideas into a market often reluctant to embrace change. Developing a worldwide dealer network has been Eric&apos;s primary focus for the past decade, and introducing new concepts was a source of some frustration for him. "It was like bringing a spaceship to a boat show," Eric recalled with a smile. World reaction to the boats varied from country to country, but Fountaine Pajot found Americans more open to a catamaran&apos;s potential. "Americans have accepted these boats much more than others. Your country has been a big help to us by seeing the viability of both sail and power catamarans," Eric said. "You people get the concept, and see what we are doing here." To help define this acceptance, Eric explained that there are essentially two kinds of people interested in Fountaine Pajot&apos;s trawler cats. The first are those sailors who already have experience on sailing cats but are now getting older and are concerned about sail handling on a big boat. The second group is made up mostly of existing powerboat owners who have no sailing background or interest but can see the basic benefits a catamaran offers. These people are less traditionally minded and could buy into the trawler catamaran concept if reasonably approached, without an emphasis on go-fast performance. The link between the two groups, according to Eric, is a boat designed for long range cruising, one on which owners can live and cruise aboard for extended periods. Anticipating the future of cruising, Fountaine Pajot believes it best to invest equally in its sail and powerboat lines. Both markets make sense for cats. Fountaine Pajot&apos;s original plan was to launch the Maryland 37, then follow with a larger, 43- foot trawler cat. But once the first Maryland 37 splashed, it surprised everyone with its size-it was bigger than expected and offered excellent space and accommodations. Trawler hull shapes are quite different from Fountaine Pajot&apos;s sailboats, and Eric explained that has to do with how power is transmitted to the hulls. Interestingly, while many think all French multihull builders are addicted to speed, this was not a particular objective for these cruising trawler cats. The company is far more interested in super efficiency at 15/16 knots. Seakeeping and stability over a wide range of sea conditions are also more important than speed. "The transition from sail to power was easier for us because we did not focus on speed," Eric told me. "We wanted to create capable boats that work well for extended cruising. And I can easily see us taking the power cat line up to 60 feet." As he spoke, my eyes gazed across the production floor to one of their larger sailboats, a Marquises 56 under construction. A huge craft that is 56 feet long by almost 27 feet wide, it&apos;s easy to envision a powerboat model that takes the trawler cat&apos;s design elements out to 60 feet. It would be a palatial cruising home, with tremendous visual and practical space, able to go anywhere in the world in stable comfort. When I later walked through the 56-footer, I could almost smell the tropical flowers, coconuts and salt air, and imagine the snorkeling, sandy beaches and remote islands. Joubert-Nivelt remains a close ally of Fountaine Pajot, and its designers will help create these future boats. "We all learned a lot from the racing cats, in terms of hull shape and construction technology," Eric said. "But the goal now is to find a balance between wave resistance and seakeeping." La Rochelle is one of the world&apos;s major racing centers and is even a stop in the famed Whitbread Round The World Race. It&apos;s no surprise that Fountaine Pajot would have chosen La Rochelle as a good place to be, especially with such easy access to the many support industries that manufacture or supply sails, rigging, engines and other equipment. But even though it is no longer a racing company, building cruising boats is only a partial explanation of the current corporate identity of Fountaine Pajot. In fact, there is a huge commercial side of the business, and a close look shows just how far Fountaine Pajot has gone pushing the envelope. Most people don&apos;t realize the company is a leading developer of big cats for commercial utility and ferry service. The corporate subsidiary, IRIS Catamarans, builds space-age catamarans that can handle up to 350 passengers, or a payload of 70 tons-at speeds approaching 40 knots! Even the Maryland 37 tooling is offered in a ferry configuration certified for 50-passenger service at 20 knots. The trawler cats and big commercial boats are built together in a huge, 8,000-square-meter facility that includes enormous rolling gantries, water-filled test tanks and scores of specialized workstations. The scale of Fountaine Pajot&apos;s IRIS facility in La Rochelle goes way beyond a normal boat yard experience, and everything is clean, adhering to strict ISO-9002 standards. The company makes extensive use of infusion technology, in which all fiberglass material is fitted dry and resin is infused into the material by vacuum bagging. It is a modern construction technique that is environmentally sensitive and uses many proprietary elements (mostly in the laminates) pioneered by Fountaine Pajot. One thing I noticed in the Fountaine Pajot/IRIS facility was a higher percentage of women on the production floor. I asked Helene de Fontainieu, director of communications, about this observation, a most unusual sight in boat building. Helene said fully 30 percent of the 500 people at Fountaine Pajot and IRIS Catamarans are women, with a much high percentage of them dedicated to the teams building trawlers. Eric said the women are very detail-oriented and have brought new ideas to the company. "Boat building is very precise," Eric told me, "and requires great attention to detail. Women make great boat builders." My head was spinning after a day of watching these women and men assembling spacecraftlooking ferries-in a facility so modern-in a town 1,000 years old! That evening, Jean Francois Fountaine was the perfect host as he picked us up in La Rochelle&apos;s inner harbor, then took us to nearby Ile de Re, just northwest of La Rochelle. A small island connected to the mainland by a long bridge, Re Island is a timeless European destination, with small harbors tucked into breaks on the island&apos;s sandy coastline. The island feels the warming effects of the Gulf Stream, and residents and visitors alike enjoy the sun and tropical sea air. Our vessel for the evening was a new Greenland 34. A couple of 70-hp Yanmar diesels pushed the cat quietly along into a slight headwind, and at 12 knots there was only a hint of wake during our 45-minute trip from La Rochelle to the harbor at Saint-Martin. The enduring protected basin at Saint-Martin proved a perfect backdrop for an outside table for five at the Beline Bleu. Jean Francois talked of boats and his love of sailing as we enjoyed oysters and fish dishes, along with agreeable local wines and fresh bread. Later conversation drifted into the future of cruising and the role catamarans will play. "Ten years ago there were just a few cats," Jean Francois said. "Today, half the fleet at the sailboat shows are cats. "We&apos;re confident of the future. These boats offer some great advantages, such as shallow draft, stability and the ability to go faster with smaller engines. With a range up to 1,000 miles, our cats have great maneuverability due to their widely spaced engines." As the premier production catamaran builder, Jean Francois is rightly proud of his company&apos;s success. Helene de Fontainieu joined us for the evening with her husband, Emmanuel, a charming fellow who shared, over a delicious fruit dessert, details of quite a different boat project. He is director of the Corderie Royale, a working maritime museum in nearby Rochefort that in 1666 was the world&apos;s largest supplier of rope and cordage for ships of the line. In addition to his work at the Corderie, Emmanuel is involved with the construction of a replica of the Hermoine, the sailing frigate that Lafayette sailed to America in 1780 and which helped fight off the British fleet on Chesapeake Bay and at the battle of Yorktown. The new Hermoine is being constructed to the exact specifications of the original frigate, and with many of the tools from that time. In 2007, a distinguished crew will retrace the 38-day voyage to Boston aboard the frigate. This exciting project celebrates the historic relationship between France and the U.S.
During my week on the Fountaine Pajot fleet, I developed a strong opinion about the potentially inappropriate comparison of these boats to others. 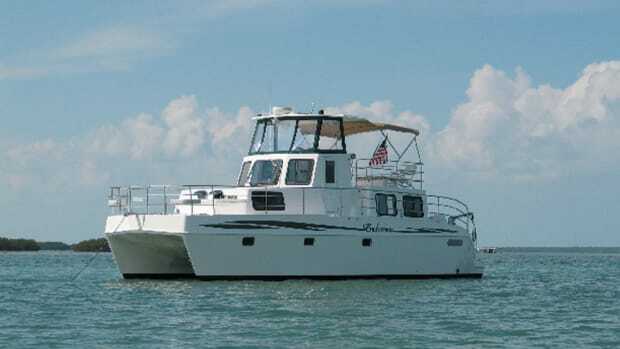 Aboard all modern power cats, of which the Greenland 34 and Maryland 37 are good examples, one notices a sparse interior treatment, showing more fiberglass and less hardwood paneling and furniture. I&apos;m concerned with the possibility that some people might compare these boats to less expensive, often entry-level boats at boat shows, many of which don&apos;t measure up in terms of quality and strength. Those "white boats" are meant for casual seasonal use, not offshore or in rough weather. I&apos;m not criticizing these craft, just pointing out their designed role for summer fun in nice weather. It is dreadfully wrong to compare the modern cat to these play boats. One must adjust and adopt a more modern stance when looking at these catamarans. They are not lavishly appointed in teak for a reason, and only those who get this can ever really enjoy a French cat. The lifestyle to be enjoyed aboard a cruising power cat is embodied with one&apos;s desire for simplicity. Fiberglass is easy to clean and keep clean, and keeps the boat light. These French builders, especially with their racing experience, know that a light boat requires less horsepower to maintain a given speed and uses less fuel to go the distance. The essence of a trawler cat is simple cruising, bringing along just enough and no more, and having less to maintain. "Why carry too much around?" was a question Eric Bruneel asked several times during our visit. If a person can look inside one of these boats and see "simple" rather than "plain," then he or she will get the point of a modern cruising cat. "Develop a state of mind that looks at what is on board, and regularly evaluate what can come off to save weight," Eric added. It is a point worth considering, especially for those of us (and I&apos;m guilty) who carry lots of gear, provisions and other weight that could easily be left on the dock. Excess weight on a boat (or us) is not a good thing, but this is especially true on a power catamaran. That said, the people at Fountaine Pajot acknowledge that some buyers will find it too difficult to make the visual transition from a traditional, all-teak interior to a modern cruising spaceship. By this fall, expect both cats to be offered in versions with more interior wood. If we look at the way most people use their boats, a displacement power cat may make a lot of sense. With Fountaine Pajot and other enlightened builders, the emphasis is on keeping a boat simple and efficient. These people think it also makes for more fun. The larger French builders are well positioned to satisfy the growing demand for these cruising machines, but they also share responsibility in getting worldwide acknowledgement that two hulls can sometimes be better than one. I plan to take a look at some other trawler cats in the coming months and bring you their ideas and solutions, but it&apos;s clear that Fountaine Pajot will be one of those leading the way. To be sure, the traditional trawler remains at the heart of cruising under power, center stage in the dreams of those who lust for comfortable adventure. A traditional full displacement or semi-displacement boat continues to enjoy its well-earned status as a safe, comfortable, economical friend. But the monohull hull shape is no longer the only choice for successfully cruising in a powerboat. As sailing catamaran builders continue to test the market with purpose-built cruising power cats, expect model lines to include choices for all budgets and plans. Boats such as Fountaine Pajot&apos;s trawler cats can be readily and safely beached without concern, offering a new twist to those who enjoy getting up close and personal in the islands. Reinforced twin keels protect the propellers and make a secure platform at low tide. The wide beam allows, indeed begs, for a good-sized dinghy that can be quickly and securely launched and retrieved. The davits on the Maryland 37 are capable of holding up to 400 pounds of dinghy and outboard. The system is simplicity itself. The other past concerns about catamaran hull forms are simply not valid anymore. These powerboats don&apos;t capsize-nor do modern sailing cats for that matter. For those fearful of taking a cat offshore, consider that all of Fountaine Pajot&apos;s sailboats over 38 feet are delivered to the U.S. on their bottoms. The downwind sleigh ride across the Atlantic involves little stress on boat, rigging or systems, so boats arrive in pristine condition. The Maryland 37 is also fully capable of a transatlantic delivery, were it not for the lack of sufficient fuel capacity and the minor detail that a new boat would arrive with several hundred hours on its engines. The other bugaboo is the alleged difficulty in finding moorage space for a catamaran. We&apos;ve talked with power cat owners, and they report it is not a problem. Keep in mind that a purpose-built power cat doesn&apos;t require extreme beam to resist the heeling moment of a performance sailboat&apos;s rig and sail plan. 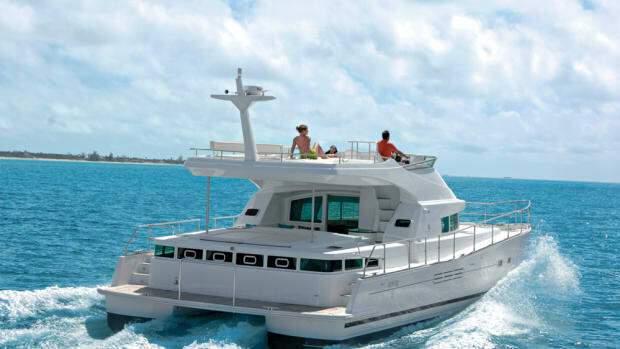 Maybe it&apos;s time you checked out one of Fountaine Pajot&apos;s trawler cats. As my dog Boomer reports, they are also very dog friendly. She gives them two paws up!